Yay! long awaited report is here finally! This report would be longer than my Busan comic world report since this time I attended comic world as a cosplayer instead of another visitor. Visiting as a foreign cosplayer is certainly an adventure! If you are interested in cosplaying in Korea. The information here might come in handy. I will write another blog post on regarding how and tips to cosplay in Korea ! My first time traveling in Seoul alone, not really since I went together with my english teacher in the morning but parted ways right after we reached Seoul. Because of that I was so excited until I woke up around 6:30 am , which my original plan was actually to wake up around 6 am. Why I have t wake up so damn early? well, thats because I had to and need to leave the dorm by 8:30. I rushed my shower and make up and managed to get most of my makeup done by 8:30am. After that, I did the rest of my makeup in school since its open on Saturdays for the dorm students to self study. Since the exam just ended, nobody really bothered to go to school to study so it was only me alone in my classroom mwahhahahhaha !!! After everything was done, I waited for my english teacher at the convenience store that was nearby her house and got myself something sweet to boost up my energy. Around 10 am, we moved to the bus station together and sat on the bus to seoul. It was a 40 minutes to an hour drive. We got off at Gangbyeon Station around 11 something and then took the subway and parted to each of our own destinations. YANG JAE HERE I COME!!! When I finally reached Yang Jae station, I decided to grab myself a bite, and since I am obviously stingy on a budget plan, I had kimbab for lunch ! only 1000 won!! (rm 3) and very filling! Can be found at most convenient stores. After filling my hungry tummy, I decided to walk out the station and perhaps catch a bus to At center. Sadly I was too stupid to even know which bus would take me there and was fed up upon realizing I cannot walk there so I decided to just take a cab from the station to At center. It costed me around 3000 won (rm 9), which kinda hurt my heart since I was alone and I was on a budget plan. ヽ(ｏ`皿′ｏ)ﾉ IT WAS OBVIOUSLY MUCH CHEAPER THAN A STUPID TAXI RIDE!! GAHHH!!!! I SHOULD HAVE GOTTEN OFF AT GANG NAM INSTEAD OF YAG JAE STATION AND TOOK THE DX LINE TO YAG JAE CITIZEN PARK WHICH WAS JUST A FEW WALKS AWAY TO AT CENTER!!! REMEMBER TO GET OFF AT YANG JAE CITIZEN PARK ON THE DX LINE TO GET TO AT CENTER!!! the line is actually much shorter than before I came I guess, since I arrived quite late, around 12:30 pm? the wait wasn't long, the committees were very efficient. Since this was my obvious first time at comic world seoul. I obviously don't know where is the changing room and where to sign up for cosplaying. So I decided to ask one of the committees, most of them speak korean but if you are lucky enough, you could find someone that is able to speak english (like how i stumbled into a few that is able to speak english). They were very friendly and nice and directed me the way there. THUMBS UP FOR PROFESSION AND EFFICIENCY!!! At center opened up two floors for Comic World Seoul and these two floors were filled with doujin booths!!! ITS DOUJINSHI GALORE!!! MUCH MUCH MORE COMPARING WITH COMIC WORLD BUSAN!!! And just so you were wondering, each floor in Comic world is around the size of AFAX in singapore!!! and two floors is just DOUBLE THE SIZE OF AFAX!!!! Each hall have wide spaces for doujin booths. and at the two ends of the hall there is some wide spaces so that cosplayers can rest or maybe hang out. 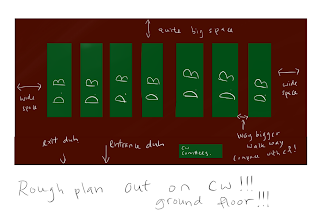 rough sketch from what i remember on ground floor, 1st floor the layout is similar but just add in the stage at the side (which the doujin booth masters cannot see ) and the changing room. Sorry I could not find where to get the event booklet so this is the rough floor plan out lah ^^"
So then, I got carried away and ended up looking around at the doujin booths since I am pretty sure it will be much more of a hassle if I were to buy alot of doujins and holding it when I am cosplaying so I think its better to buy all the doujins first. besides, they might be sold out pretty fast. And so, after I filled in the forms to cosplay, I went to the changing room to change into my costume.The wait for the changing room was pretty fast too! each person will be given a number and a room assign to change. The changing room size is pretty big and its set up like in one cubicle each. Maybe around 55 stalls? the size was quite ok, its like a shopping mall's changing room, just that it is portable. Its pretty efficient!! too bad some room were a bit dark ^^" and there is no mirrors in each rooms but then its already considered good enough for an event like this. Anyway after the changing into my costume, I went to stalk cosplayers and take cosplayers photos, thankfully my camera is functioning for the day, it did not die on me like the last time i used it in Busan ^^"So then, my first stop would be the main entrance of the AT center. So, after stalking almost all the cosplayers I seen in the entrance that actually catches my attention, I decided to move of to the place where to crowd was heading to, Interesting thing was they wasn't actually heading towards the event hall but somewhere outside. So out of curiosity, I obviously followed them. and then i kept following the crowd until someone called out "JAFAL!" and the I looked infront and found a yamuraiha with pika pika eyes looking at me asking for a photo. I was of course happy! We posed for each other and took each other's photo, after that she came over and talked to me. I talk to her with my very bad korean and when I felt pushed into the corner....I blurted japanese instead orz *fail* But then body language works so she invited me to walk around with her :D Which I was certainly happy ! Being in a pair is better than going solo hahahha. more magi cosplayers on my way! there is also stalls outside the event hall, usually selling those type of anime-tech style of merchandises and some korean snack and water to cosplayers. Pretty convinient! HURRAY THERE IS WATER!!! but then again, they were busy shooting so I decided to leave them alone. So like at the basement floor of At center there is actually a few shoplots where you guys can buy your lunch at. Some of them are opened, there is a convenience store and a Chinese restaurant if you are craving for better food. halal or not I did not really check ^^"
Feeling slightly braver, I end up venturing deeper in the park, on places I tend to miss out and I find more cosplayers resting there, after all its spring and its cooler outside than being cooped up in the event hall. The cosplayers really know how to camouflage into the forrest. but it still blends in pretty well. I had a hard time trying to find cosers that are nice and free so I can have a photo of them taken. I literally ran towards them, only seeing pitsi and another yamurai (not miro) walking away , leaving sharrkan alone. When she saw me she was also surprised (yay white rufu!) and obviously she recognized that I was cosplaying as jafar. I asked her to pose and have her photo taken and then waited for the rest of the magi cosplayers to come back. when they came back, they were excited as I was. We end up talking for a while and then soon I realized they could speak very very good english! Which was pretty rare! after changing, I decided to have dinner at Gang Nam station and then travel back to Gam Byeon station and take the bus back to dorm . Gang Nam station has lots of good food around. There is even lotteria if I am not mistaken but I was in a mood for something less oily so I ate Oden instead. Without realizing it was kinda spicy because of pepper overdose. But overall its quite enjoyable anyways. Honestly speaking I cannot wait for the next comic world in korea already!